"Gulmohar Grand" is an Upcoming Star Plus Tv serial which is going to Launched on May,03,2015.This Show is Produced by Famous production House "Sunshine Productions" . Earlier this show was titled as 'Hotel' , but later the Title of the Show changed to "Gulmohar Grand". Sunshine Production House is the also known as Sudheer and Seema Sharma's Production House. Star Plus Upcoming Tv Show Gulmohar Grand is based on the backdrop of the Happenings in a Hotel. This show is basically focus on the Lifestyle of Hotels. Their hospitality and service is amazing. But Annie (Aakanksha Singh) is working here with a set motive. What is her plan? 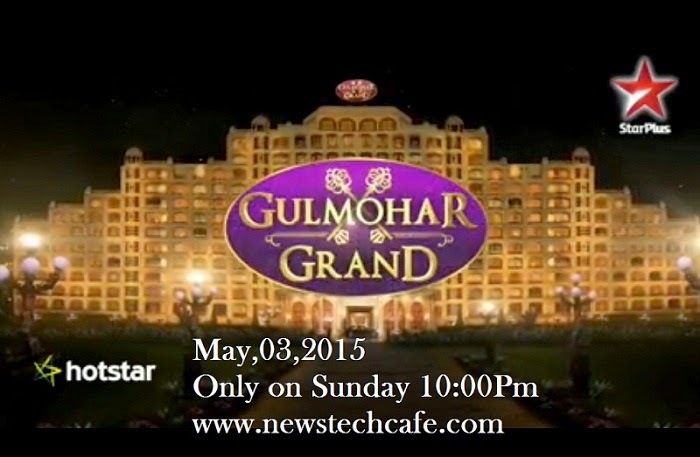 To find out, check in to Gulmohar Grand, starts 3rd May, Sunday, 10 PM only on STAR Plus. The Shooting for the Show Started Currently Shooting of " Gulmohar Grand " is being show in 5 Star Hotel in Mumbai. Aakansha Singh and Gaurav Chopra will be seen in Lead Role in this Show. Aakanksha was last seen in the Show "Na Bole Hum Na Tumne Kuch Kaha" . Gaurav Chopra is Last Seen in Colors "Uttaran" Tv Show in the role of Raghvendra Pratap Singh and Also seen in Channel "V" Sadda Haq Tv Show as a Drunkard Member of Dream Team. Official Promo of the Show is released by Star-Plus on Youtube .You can watch it online here or on youtube.com.After Watching the First look of the Show i can assure you the Show is nice. Aakanksha is Looking Pretty Gorgeous as Member of Hotel.